"LeapFrog Connect is having trouble communicating with your handheld. Please turn your Leapster Explorer off and on again. If you continue to experience problems you may need to update the software on your handheld." 1. Launch the LeapFrog Connect application while connected to the Internet to ensure LeapFrog Connect gets the latest Leapster Explorer Firmware update packages. 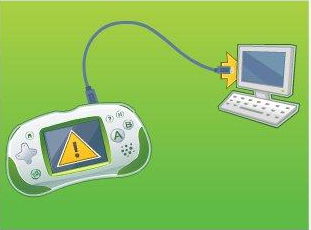 Wait for LeapFrog Connect to finish downloading updates (the message center will stop displaying “Downloading Leapster Explorer updates…”). 2. While the Leapster Explorer is in the OFF state, hold the Left shoulder, Right shoulder, and Hint(?) button. Then, while pressing all 3 buttons, power on the Leapster Explorer. 3. The device will show the following “Tune Up” screen. Do not proceed until the device shows this screen. 4. While the device is showing the “Tune up” screen, connect the Leapster Explorer to the computer used in step 1. 5. LeapFrog Connect will automatically start installing the latest firmware, showing a tune-up progress bar on the computer screen. 6. When finished, the progress bar will go away and the Leapster Explorer should be connected (showing the eject button).